Wrinkles are a part of the ageing process. They can be attributed to sun damage, effects of gravity and muscle contraction resulting from facial expressions such as ‘frowning’ and ‘laughing’. Wrinkles caused by muscle contraction such as ‘frown lines’, ‘forehead lines’ & ‘crows feet’, can be improved by Wrinkle Relaxing Injection treatments. The product is injected into the muscles that are causing the wrinkles, using a very small needle. 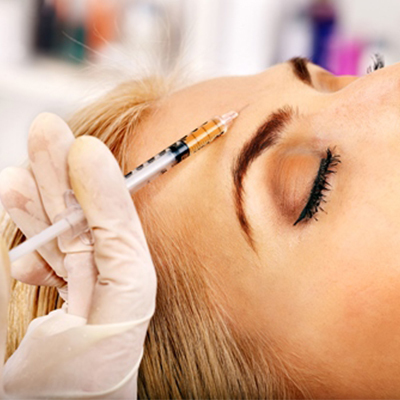 Several injections are usually needed at specific sites, depending on the area treated. When used to treat excessive sweating in the armpits the product is directed into the axillary skin. Localised discomfort and bruising can occur but no local anaesthesia is generally required. The product takes effect in 24-72 hours with maximum effect in 1-2 weeks. The effects generally last 3 months resulting in the face having a more relaxed and smoother appearance. In the case of excessive sweating in the armpits results last approx 9 months. Whilst the use of the product is highly effective in treating wrinkles due to muscle contractions, it has no effect in reducing lines caused by ‘sun damage’ ‘sagging facial skin’ or patients with very ‘heavy’ lines. In this case Dermal Fillers are a better option. See Dermal Fillers page for more info. Your expectations will be clearly noted, an analysis of your face & skin. Whilst taking an analysis of your face and skin I will provide you with an open and honest evaluation and note your expectations, this will ensure we have a realistic expectation. A medical questionnaire and ‘before’ picture will be taken for re-evaluation at your ‘follow-up’ 2 weeks later. Due to legislative changes all patients will be required to complete a medical questionnaire during consultation which will be assessed by our resident prescribing medical professional prior to Wrinkle Relaxing injectable treatment. Additional areas free of charge when booking a 3 area treatment. Clients having 3 areas treated can have additional ‘lower face’ treatment at no extra cost. Insured by “BGi” Insurance. Due to legislative changes all patients will be seen by our resident prescribing medical professional prior to Wrinkle Relaxing injectable treatments.